Christmas Ornaments Made in USA - 2004 American President Collection Complete Set of 10 Orname - A Christmas Ornament Co.
A Christmas Ornament is your one stop for finding Official Holiday Ornaments. This year we have added more agencies to offer you, our customers, more collections. The 2004 American President Collection Ornaments all feature a 24 Karat Gold Finish and Fine Porcelain. The set includes; Abraham Lincoln, Andrew Jackson, Franklin D. Roosevelt, George Washington, Harry S. Truman, John F. Kennedy, Ronald Reagan, Theodore Roosevelt, Thomas Jefferson, and Woodrow Wilson. 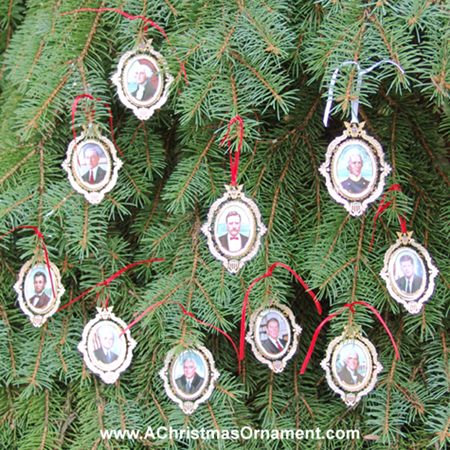 First, you will need to search for The American President Collection ornament that you would like to order. Click on one of the descriptions below to find out more about our gifts, including available delivery dates.Please allow two to four weeks for delivery.